when particular items are bought and many many more conditions you can think as per your needs. 3. Fees can be set globally in the store. USE CASES 1. Add a conditional fee for a geographic area like country, state, postcode, zone. E.g. If you want to charge extra fees to customers who want shipping to Alaska state of USA, you can add $20 as a conditional fee. 2. Add a conditional fee when a specific user/ user role buys any product. E.g. If you want to charge extra fees to all customers who have basic customer role and who are not Admin or Vendor or Premium customer, you can add $10 as a conditional fee for Customer role only. 3. 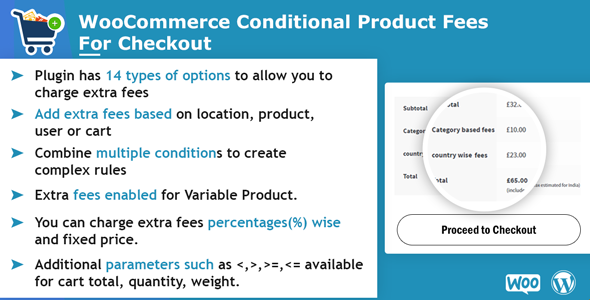 Add a conditional fee for several store categories, product and tags. E.g. If you want to charge extra fees for all products which are in the Shoes category, you can add $15 as a conditional fee for Shoes category. In the same manner you can charge extra fees for a particular products or all product with a specific tag as well. 4. Add a conditional fee based on cart total, total weight of products or total quantity of products in cart. E.g. If you want to charge $20 when customer adds 1 to 9 pieces of product in cart, and $5 when he adds 10 or more pieces, you can create 2 rules to configure this scenario.